part 1 – twelve days, seventy-two hundred, sixty miles; three flats and two shooting stars…. ….not necessarily in that order. there were numbers of things. there were wondrousnesses and magicnesses. there was chicago and ohio. there were interstate highways. the interstate highway system is a system of roads, highways and expressways built by the federal government that YOU use to get from point A to point B, many built by the WPA and other FDR depression-era programs and continued by republican president dwight eisenhower in the 1950’s. do you understand any of that, scared white people? there was a full moon. there was darkness. there were millions of stars i hadn’t seen in years. one night, i could swear that there were a billion stars out. it was as if new stars appeared to introduce themselves. that was the night of the shooting stars, when the universe was so happy and brilliant, that i had to stop my car in the middle of the interstate and get out. i stood on the double-yellow-line and saw that there wasn’t a car coming or going in either direction for a miles. it was ok. i can do this, i thought. i looked up and met the big sky for a moment, then lay on the hood of the car letting the engine’s heat warm my back. i admit to luxuriating like this for barely five seconds before the thought of a massive auto accident shook me to the blacktop. i surveyed the highway for oncoming traffic. something was in the distance, a few minutes away. i wasn’t going to be too casual about it. i gave thanks for the moment and returned to the car. maxx was sitting up in the passenger seat waiting, like he was a taxi fare. “you wouldn’t understand,” i said to him. 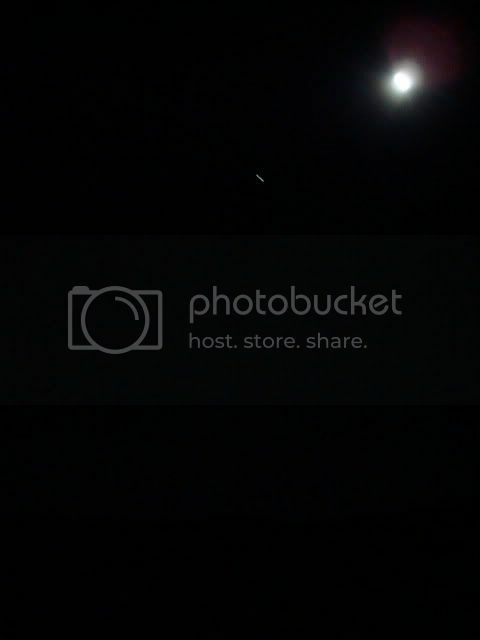 this was the night that i saw first, a “falling” star, inasmuch that it was moving vertically-downward, followed by a “shooting” star, moving in a horizontal arc. of course, in the universe, all directions are…objectively subjective. these are the reason i stopped the car. unfortunately, i didn’t see a third shooting star when i stood on the interstate. i texted my friend in oregon about it, though. she thought it was wonderful. i hoped that she felt a glimpse of my joy. however, i didn’t tell her i was playing in traffic. she’d have gotten pissed, worried or both. this may have been in minnesota or the dakotas. this was before i found the the “super8” motel where i would get the handicapped room (because that’s all there was left) and have a conversation with the night clerk named sharon who looked suspiciously like my sainted-irish mother if she ever were ever healthy or happy in her later years. her irishness never allowed joy. her luck would seal that deal. it wasn’t her fault. when i filled out the guest sheet, sharon noticed “brooklyn,” and commented. “i was in brooklyn, once,” she said. i walked out and returned with maxx. he was still trying to figure out what this traveling was about. it took a while to find a motel that’ll take a dog. let me change that – …that’ll take a dog this big. maxx is no teacup lapdog. he’s been anxious and well-behaved and is OK in the car, but becomes afraid if i leave him anywhere else, even for a moment. sharon commented, “he’s a big boy, ain’t he,” in a small-voiced deadpan sort of way. maxx jumped up and put his paws on the counter and sniffed around. i apologized, nudged him off, took the key and walked away to the room. the difference between a “room” and a “handicap room” is that you can roll into the room, roll into the bathroom and then roll into the shower. there’s no tub or floor barrier of any kind. the whole room is tiled and there’s a floor drain or two. you learned something new today, maybe. 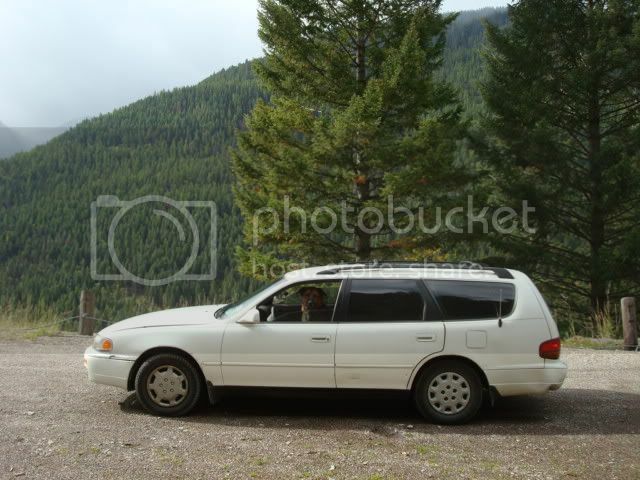 earlier this day, i was pulled over by a state trooper whose initial reason for stopping me was the tint on the windows of my fifteen-year-old stationwagon. 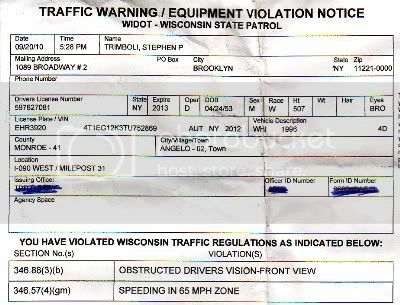 that was after he approached the car by the passenger-side even as i waved my license and registration out of the driver’s side window, trying to avoid a state trooper-maxx clash. i kept the window on that side of the car opened about one inch. of course, all i could tell him was that i bought the car two months ago and couldn’t speak about window tints and the law in new york. i did tell him it was a 1996 car. looking into the car, he then took aim at the air fresheners that hung from the rear-view mirror. he told me that i had to take them off because it obstructed my “driver’s view” or something, then questioned me about the small earthenware jug that my peppermint air fresheners obstructed. “what’s that little jug for?” he asked me. i thought about telling him about my eighth-grade english medal keychain. that’s hanging up there, too…. 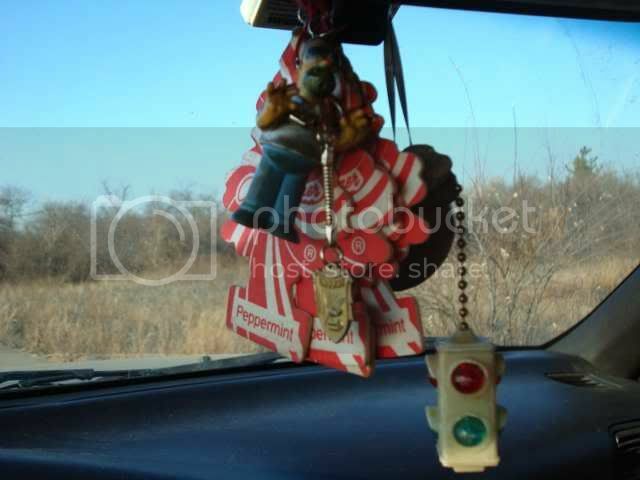 and homer simpson….and my traffic light. “so, what are you doing out here?” he asked. 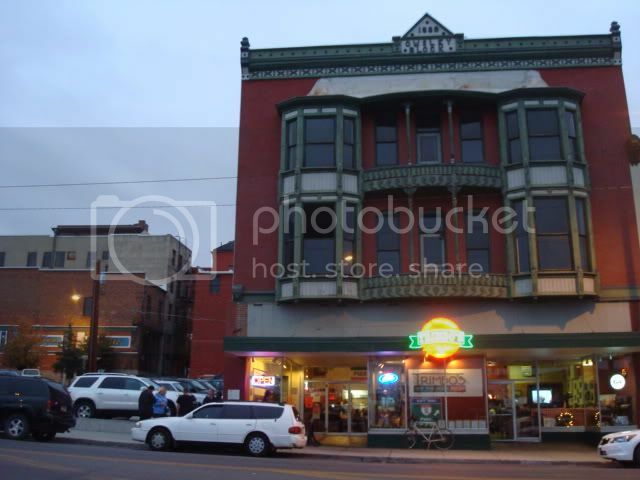 “i’m heading to butte, montana. my brother has a pizzeria that’s gonna be on teevee in a couple of days.” i answered. he was pointing at the sleeping bag in the back of the car. “what?…that’s a sleeping bag,” i said as i took out a goodbye blue monday business card. i realized this guy had a bad case of the “charlie manson willies”. he took the license and registration that i held between my fingers during this whole exchange. “you finally cut to the chase,” i thought to myself. he walked back to his car and remained there for almost ten minutes. i imagined he was running my name, license plate, car vin number, window tint – ahh the window tint…whatever he could. i never saw a warning in black and white. it made me wonder what happened to the world i knew. this wasn’t a complaint, rather a point of introspection. good thing i have a scatterbrained attention span. i didn’t want to dwell on this. as i recall this journey with maxx, i understand that i won’t explain it in a linear fashion. i can’t. i’ll tell you that it took almost two whole days for maxx to eat or sleep. this was his first road trip. there are other things that jump up at me and demand to be spoken about. “me first,” said the photo i took on my return to gateway national park yesterday. 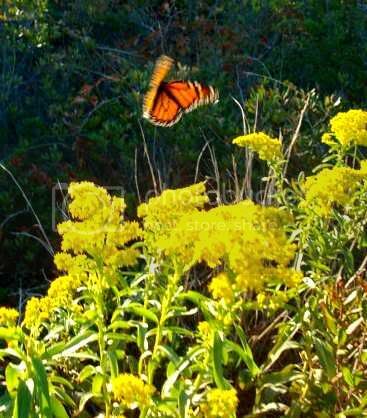 …but northern montana doesn’t have monarch butterflies. that lizard-guy who sounds like eduardo ciannelli and looks like omar sharif was. as i entered the parking lot, a red, jeep wagoneer sat parked in the closest spot to the entrance on my right. my eyes caught a figure in the driver’s seat as i passed it and i instantly knew who it was. i parked further into the lot and prepared my traveling bag for the walk. i approached the jeep and the window lowered slowly. maxx turned away and sat quietly. these lizard guys scare the bejesus out of him, let me tell you. “i knew it was you,” i said. i would learn in this conversation that the grifting lizards from mars can exchange places with one another anywhere in the universe, just like that. all they have to do is contact another lizard guy who’d agree to do it. the eduardo ciannelli-sounding lizard guy (who looks like omar sharif) told me that it takes about two earth minutes, so when he knew i was going out there, he “dialed” a friend and did a swap. i’d venture to guess that if you’re a lizard honcho like this guy, he could probably just order one of these. he told me about butte, montana and all the grifting and greed-farming that went on out there at the end of the 19th and beginning of the 20th century. he told me that there was so much wealth, power, greed and avarice that while it was a boomtown for copper and cash, it was also great for their diet. “deelish,” he said. 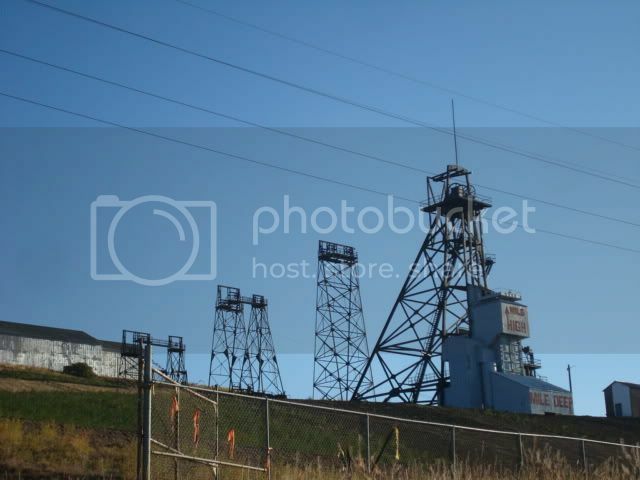 the mining companies constructed their mining claim and built housing for their workers. people immigrated from all over the world to work there. grifting lizards traveled from all over the galaxy to dine here. he likened it to silicon valley in the 90’s and wall street three years ago. 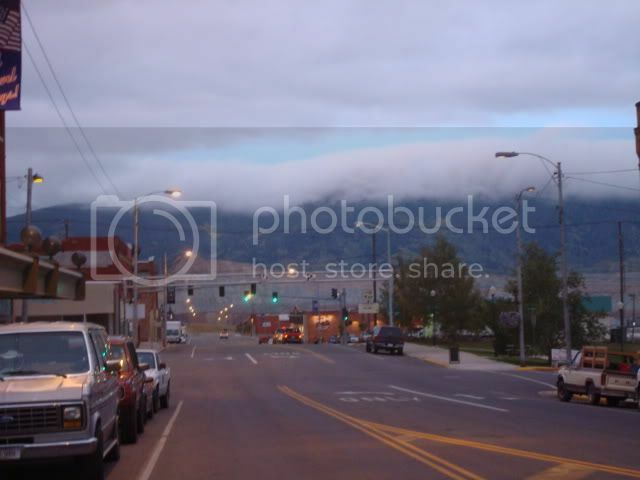 he told me that butte had electric streetlights before new york did. and that there’s ten thousand miles of underground mineshafts and tunnels there. this is what outside of town looks like. 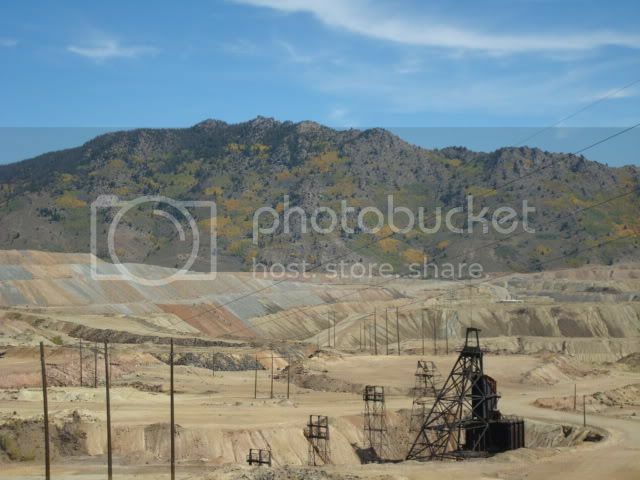 someone told me that it’s pretty toxic, and it’s become a superfund site. i think the planet is becoming a superfund site, but that’s just my opinion. i’m asleep in a handicap motel room in south dakota. when i awoke, i drove through south dakota, wyoming (where i learned that alice cooper is a radio DJ in gillette, WY) and into montana. i never knew that montana was the 4th largest state in the US. i learned this as i plodded across. when i got past billings, i settled in at a rest area on route 90.
i have that sleeping bag the nebraska trooper thought contained a body. maxx chose to zzz-out in the front passenger seat. i thought about this vacation. was it a vacation? 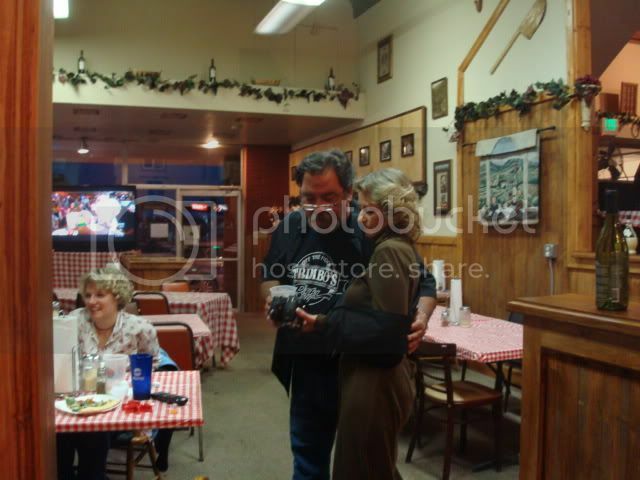 it was more like i was going to explode if i didn’t get out of town and at the same time i knew that rookie and frank’s pizzeria was going to be on man versus food-butte, montana on the travel channel. they shot the episode in august. 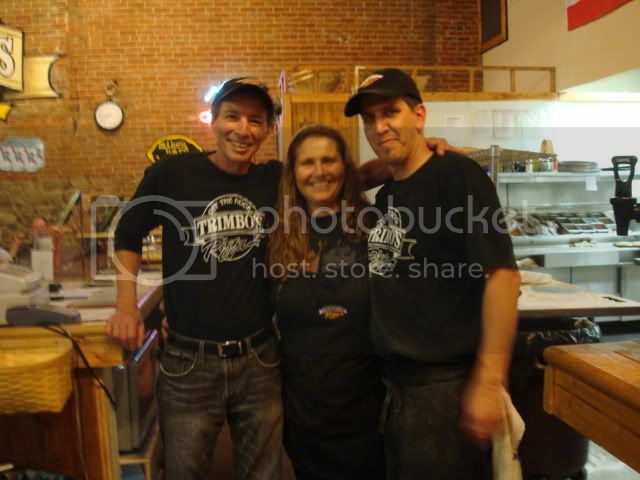 when i woke up at the rest area outside billings, montana, i knew that i was just a few hours away from “trimbo’s off the hook pizza“. the best part about this was they didn’t know i was coming. most surprises in my life didn’t work out too well. i disregarded this notion regarding my brother and friend and niece – she live’s out there, too. i figured they’d be a better sport than me and they were. i showed up in the middle of the afternoon and it was as if the space-time continuum was bent for a few seconds while my elon (my niece) and jenn (franko, my bro’s ladyfriend) processed this person (me) walking into the store. 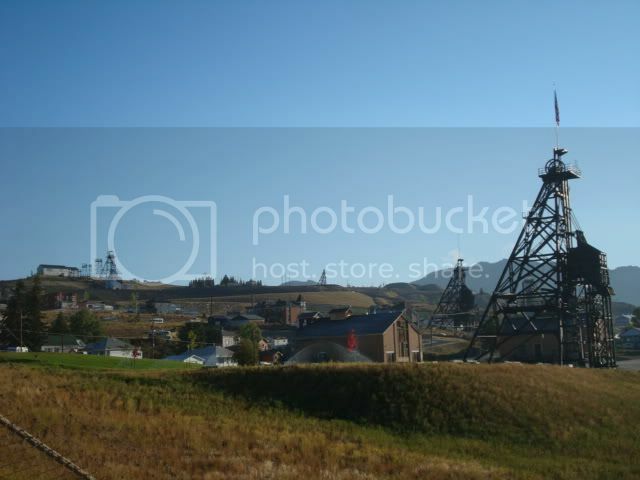 and these are my butte, montana friends and family. the place was packed for the TV viewing that night. i would head west from there the following afternoon.